We help individuals and organizations clarify their goals, take intentional & purposeful action, and realize their personalized vision of success. Scroll down to learn about UXL. Self-awareness can strengthen communication, improve team dynamics, and advance leadership. Unearth individual and team potential. Discover personal talents, as well as perceived barriers to success. Understand your purpose and direction. Take action to make meaningful career or personal changes. Find out how Insights Discovery can make a difference in YOUR life. Improve interpersonal communication, create harmony and balance, and solve team tensions. Start seeing better results by developing a profound understanding of your teammates and co-workers. Make sense of team dynamics and discover who is suited for certain tasks. Planning needs purpose; action needs direction. Discover the benefits of one-on-one coaching. Using a variety of tools, we work together to create an action plan that drives positive change. Individual, personalized coaching can make a world of difference. Explore how coaching can help YOU. We create a safe environment for groups to gather and develop strategies to overcome common issues. Peer coaching helps your team grow, resolve issues, and improve communication. We work with any industry, from nonprofits to corporations. Interactive talks; advice you can apply today. Skip the lecture. Be engaged! If you are engaged, energized, and interested, you are more likely to retain information and walk away feeling motivated to make positive change. Choose from one of UXL's keynotes or let Margaret customize a presentation especially for your team or organization. "What a great discussion! It was extremely thought provoking. Thank you for your insight!" "Margaret Smith was terrific. I have attended a lot of workshops over a long period of time and she has some suggestions that I had never heard before." "Margaret's teaching technique is awesome. She articulates her points in a clear and concise way so that student can easily understand the concepts that are being taught. She also has a caring demeanor towards the people that makes them feel comfortable and important." Become the leader you already know you are. Whether you've never held a leadership role, or you're aiming for that next step up the ladder, UXL provides personalized leadership training. There's a reason our motto is "Creating Successful Leaders!" All leaders need a little help at one point or another. We work with leaders from all industries to improve one-on-one interactions, increase team productivity, and start seeing results. It's time to develop YOUR leadership action plan. Focus on one key leadership attribute, ten minutes at a time. 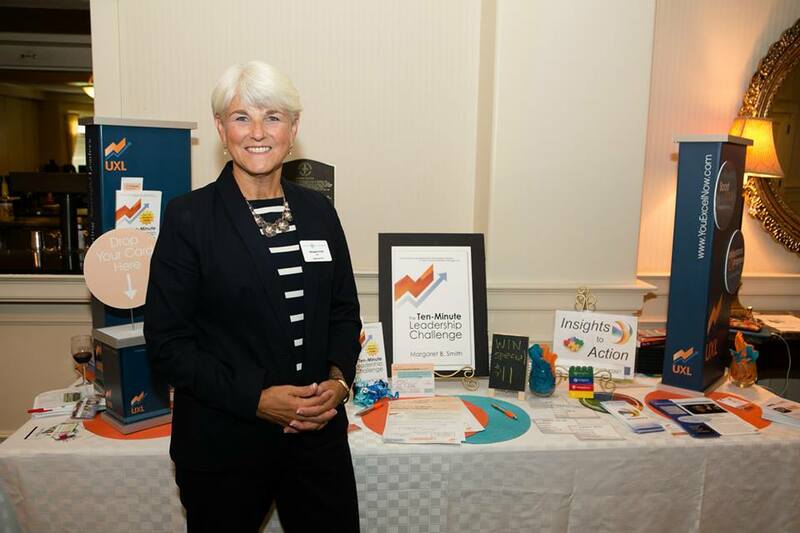 In her instructive and interactive book, The Ten-Minute Leadership Challenge, Margaret Smith uses her thirty years of leadership and managerial experience to constructively council and motivate you to achieve your full leadership potential. We don't just talk. We act. A sampling of our satisfied clients. For specific case studies, contact us. Hire UXL to help you or your company realize a personalized vision of success. How can UXL help you?